With a Blues Brothers’ “Mission-from-God!” determination, I’ve been seeking opportunities to create beautiful art of people that also portray unique physiques and personal appearance. This stems from my passion to counter the overwhelming number of pervasive images used to depict what “ideal” people should look like. These visual messages promote fear over love – fear of being imperfect, unlovable, and outside the norm. Instead, wouldn't life be more interesting if, for example, Victoria’s Secret’s annual TV special featured women of all sizes and shapes? Simultaneously, people have been suggesting to me for months that they’d like to see my art cast from many types of athletes, besides ballerinas. Then, the artistic photographer and owner of Robert Anderson Gallery (Robert) suggested contacting the nearby US Olympic Committee. Flashbulb! This potential opportunity would fulfill my desire to portray both athletic bodies and uncommon bodies – by making art of Paralympians. In turn, the USOC saw my art as a perfect match for their Colorado Spring’s Training Campus Visitor Center. Although the USOC is inundated with proposals from artists and photographers, they responded quickly to my outreach. I was invited to discuss my project while enjoying a behind the scenes tour and lunch at the athletes’ cafeteria. The greatest gift of that visit was meeting Sophia Herzog. I first noticed Sophia when I approached the Center’s reception counter, then again as she walked past me. Her body looked super-strong, beautifully curvaceous, yet intriguingly unusual. While introducing myself, I learned Sophia is an USOC Paralympic swimmer, silver medalist, and two-time World Champ in the breast stroke. Sophia is also finishing her Broadcast-Business major while training while training for her final race in Tokyo 2020. Whew! Later, I learned online that we share many interests and similarities, including a strong affection for making art. I have long-wanted to create figurative art that features water. So I invited Sophia to be my first USOC model to cast, but also to assist me with other steps in creating her art. From working with Sophia, I sense that she gives her all to any project she takes on. 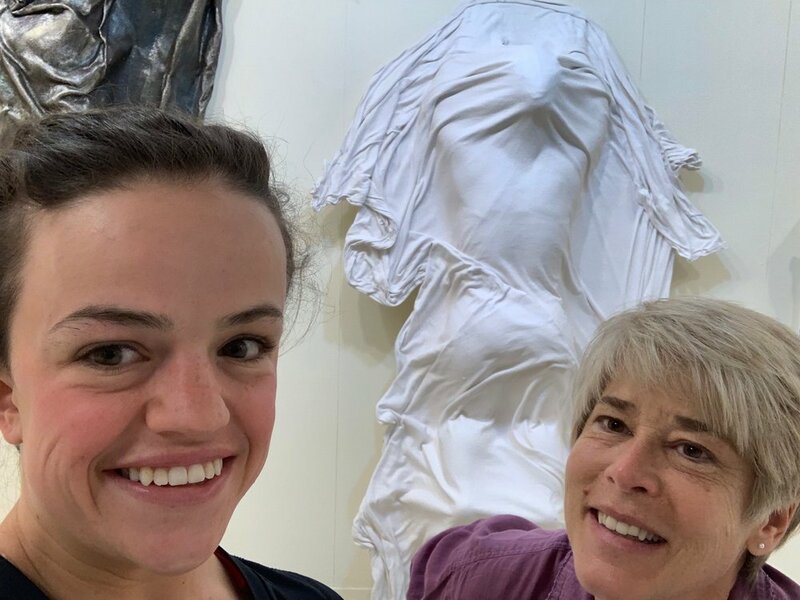 She immediately accepted my invitation to participate and came to my studio, plus saw my sculptures of dancers at Colorado Ballet. Sophia is also decidedly self-confident and proud of her unique figure. For example, when we picked up lunch at a nearby Chinese buffet, the restaurant was packed with young families. I wondered how the kids would react to seeing Sophia’s 48” adult height and short arms and legs. (She has a dwarfism called achondroplasia.) I wondered how Sophia would feel and respond. Then I was comforted to realize she’s probably encountered this situation on a daily basis since she was first cognizant of being human. I was the one concerned and without such experience. Sophia went about the buffet same as me. Many customers did a slight double-take, then looked away. Kids spun around and bumped their parents or another child with a quizzical look on their faces. Then all went back to selecting food items. This situation illustrates the commitment Sophia and I share to exemplify inclusion of everyone into all aspects of society, through our unique abilities and endeavors. Because of Sophia, these families could have a conversation about looking different and being similar. (Little did they know of her athletic accomplishments!) The more we see, the more familiar, comfortable, and accepting of “others” we become. One of my favorite slogans I saw on the t-shirt of a man seated in his wheelchair says, “Don’t Dis My Abilities.” All I can see in Sophia and the persons I know facing “disabilities” is superior capabilities in most every aspect of life. How is it that Sophia could ever be considered “disabled?” She could swim circles around me, a former lifeguard. Well for one, thing Sophia has to do maybe twice as many kicks and strokes! That’s an extra challenge. She recently had two knee surgeries – the breast stroke whip-kick is especially hard on them. Sophia also had to believe she could put herself out there on the world stage. Likewise, Sophia’s body is more suited than mine to some situations. She could use both her hands and legs to grip and open a large artists’ gesso container in my studio. I could only wrestle the lid with my hands. It is my intention to have this art of Sophia plus two more works on display at the USOC Visitors Center by the Memorial Day 2019 weekend. We invite you to experience this emotionally compelling art and the athletes it represents. Plus, it is fascinating to see the entire Center. Perhaps you can be lucky enough to score a tour with Sophia! Are you looking for specific information about myself or my work? Please contact me for sales, leasing, custom projects, or to schedule an interview. If you’d like to follow me and my art practice, subscribe to my email newsletter below.